Provides easy-to-use editing of any page section. This plugin doesn't require any revision or preparation of your pages – just install it and let's rock! No preparations are required. Works out of the box. Don't waste your work time for long pages scrolling. Being wiki-ninja requires to be fast. This plugin will make you fastest. Edit-links will appear near every heading. Clicking "Edit" brings editor with content of the corresponding section only. When editing single section you shouldn't find it on a big page and you can concentrate only on the text you are working with. 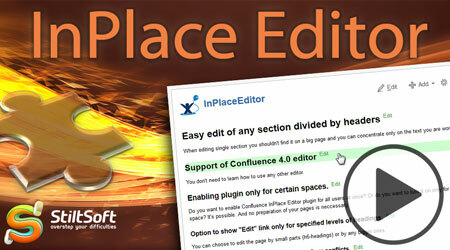 Support of Confluence 4.x editor. You don't need to learn how to use any other editor. Version for Confluence 3.x with support of wiki-markup is still available. You can enable the plugin only for certain spaces. Also there is option to show Edit-link only for specified levels of headings.